Note: This is the final version of the conference schedule and takes precedence over the one listed below. The 2008 AIEA Annual Conference was held on Feb 17-21 in Washington DC. Preconference workshops were held on Feb 17-18. The conference started at 2 pm in Mon Feb 18 and ran through Wed Feb 20. Advocacy Day will be Feb 21. The 2008 AIEA Conference Hotel was the JW Marriott Pennsylvania Avenue in downtown Washington DC. As globalization leads to an internationally integrated production and consumption of goods, cultural products, and services, local and national identities are challenged. More individuals are transnationally mobile and even larger numbers of people are globally-linked even without leaving their own localities. How are local, national, and global identities integrated? What ethical questions are posed by the problematization of identity in a globalized environment? How can students be prepared to be citizens of a globalized world? Colleges and universities face new and growing challenges in a globalized environment. Educational institutions must compete for faculty and students who are internationally mobile. Accreditations and rankings are becoming increasingly internationalized. Curricula must be revised reflect the demand for international competence. International partnerships and alliances pose both risks and opportunities. Universities are drawn increasingly into the public policy arena when state actions hinder mobility or reduce the competitiveness of university systems. Globalization leads to new patterns of student and faculty mobility and new challenges for articulation . Students not only move between institutions within one country, but also between countries and across continents. Multinational agreements, such as the Bologna process, may increase some dimensions of mobility but reduce others. Local strategies in response to increased mobility and articulation vary widely. Globalization heightens the demand for international competence, and to achieve that competence, international experience. Traditional experiences such as study abroad, are growing rapidly, and at the same time they are being re-evaluated and reconceived. Other forms of experience, such as internships and service learning, are attracting increased attention. Metrics for assessing the value of these learning experiences are in demand. The academic disciplines are challenged in many ways by globalization. The rise of IPE (international political economy) in political science is an example. Comparative law, comparative politics, comparative sociology, comparative history, and comparative cultural studies are other examples. English literature is now a transnational rather than Anglo-American discipline. Management, Public Administration, Medicine, and the other professions have become increasingly internationalized. The internationalization of faculty, as well of subject matter, helps drive these changes. As the President-Elect of AIEA and the 2008 AIEA Conference Chair, I am issuing this call for conference session proposals. Reserve the dates of February 17-20, 2008 for the Annual Conference of the Association for International Education Administrators. We will be meeting at the JW Marriott in downtown Washington, DC. The theme for the 2008 program will be Globalization: Implications for International Education. We are planning a provocative, wide-ranging, and rewarding annual conference and we look forward to your participation. Globalization has been driven in large part by information technology, and information technology itself poses challenges to higher education. At the same time, information technology offers tools that can make institutions more international by facilitating the international exchange of information, creating international access to conferences and courses, and improving the quality of instruction in foreign language and area studies. Issues of design, cost, content, and compatibility pose significant challenges for users. We want to encourage smaller group interactions and hope to receive proposals for roundtable discussions among members on issues important to CIEA positions. These small group interactions could be at different tables at lunch or during the regular program session times. We will also try to develop breakout sessions following specific plenary presentations. We also invite you to submit proposals for more substantive half and full day pre-conference workshops. Please provide proposals for sessions as outlined above. These can take the format of a pre-conference workshop, panel discussion, research presentation, roundtable discussion, or poster session. As Vice President/President Elect of AIEA and the 2008 conference chair, I encourage you to organize presentations and/or sessions on the topics listed above or on any other innovative topics and issues related to international learning, leadership, and public engagement. For full consideration of your workshop or session proposal, please complete the proposal form and submit no later than September 17, 2007, earlier if possible (by July 15 is strongly encouraged), using the submission format which appears as a link (No longer available) on the conference website. We will then review all submissions and respond regarding acceptance status. We will also ask for detailed information on final session plans including persons presenting or responding, as well as a final abstract. To help guide your thinking and written submission, please review the information below. Sessions are generally 75 minutes long so please limit panel proposals to three presenters to allow time for discussion. Participants are encouraged to be innovative and thought-provoking in their design of the session and should consider alternatives to the traditional reading of papers and panel discussions as appropriate. If you wish to submit a workshop or session proposal, please provide all of the information requested in the submission form. Email submissions of proposals or other email correspondence should be sent to [email protected] . Ambassador Alfonso Quiñónez is the Executive Secretary for Integral Development and Director General of the Inter-American Agency for Cooperation and Development of the OAS. Previously, he held the position of Chief of Staff to the Assistant Secretary General. Prior to that position, he was the Director ofthe Office of Policies and Programs for Development of the OAS Executive Secretariat for Integral Development. During the period between May, 2004 and January, 2005, he was Acting Executive Secretary for Integral Development and Acting Director General of the Inter-American Agency for Integral Development. He joined the OAS in July, 2001 as Director of the Department of Cooperation Policies. Previously he served as Executive Director of the Alvaro Arzú Foundation for Peace in Guatemala and as Advisor to the Mayor of Guatemala City. During ten years, Ambassador Quiñónez was a member of the Guatemalan Foreign Service, having held the positions of Counselor in Spain, Minister Counselor in the United States, and from January, 1998 through April, 2000, Ambassador, Permanent Representative to the Organization of American States. Ambassador Quiñónez is an attorney and notary public graduated from Francisco Marroquín University of Guatemala and holds a masters degree in Common Law Studies from Georgetown University. He was a fellow at the School of Public Affairs of the University of Maryland, studying United States Foreign Policy Making. He attended the Inter-American Defense College, having been the first Guatemalan civilian that participated in such course. During 2002 and 2001, he was a professor in the Schools of Law and International Relations of the Francisco Marroquin University in his native Guatemala. Mira Kamdar, an Associate Fellow of the Asia Society, was a Senior Fellow at the World Policy Institute from 1992 to 2006. She founded the Institute's program on Emerging Powers: China, India, Brazil and South Africa, and was a founding member of the program on Citizenship & Security. She served as Acting Director in 1996-97. Kamdar is the author of Planet India: How the Fastest-Growing Democracy is Transforming America and the World (Scribner 2007). Her critically acclaimed memoir, Motiba's Tattoos: A Granddaughter's Journey from America into her Indian Family's Past (Public Affairs 2000; Plume 2001) was a 2000 Barnes & Noble Discover Great New Writers Selection and won the 2002 Washington Book Award. Kamdar was a core member of the Pacific Council and the Observer Research Foundation's bilateral U.S.-India task force, and was one of the principle authors of the task force's ground-breaking 2005 report India-US Relations: A Vision for the Future. She is a contributing author to the four-volume Encyclopedia of India (Thompson Gale 2007), edited by eminent historian of India Stanley Wolpert, writing the entry on "Contemporary Culture in the U.S.-India Relationship." Mira Kamdar's work has appeared in numerous publications, including The Times of India, Daily News & Analysis, The International Herald Tribune, The Los Angeles Times, The Chicago Tribune, World Policy Journal, Seminar, Tehelka and American Theatre magazine , and she has provided expert commentary and been interviewed for radio and television outlets as diverse as CNN International, the BBC, TV Ontario, Public Radio International, Headlines Today, South Asia World, and TV Asia. Kamdar is a member of the editorial boards of World Policy Journal and India Review. She is a member of the Pacific Council on International Policy and of the South Asian Journalists Association, and is a regular speaker at high-level international gatherings. Mira Kamdar was born in Seattle, Washington. She received her BA from Reed College (Phi Beta Kappa), and her MA and PhD degrees from the University of California at Berkeley. She was a Thomas J. Watson Fellow in 1980 and a Danforth Graduate Fellow in 1981-85. She has lived in France, Japan, South Korea and India, and is fluent in French and Hindi. She currently lives in New York City with her husband and two children. Kamdar is represented by Sterling Lord, Sterling Lord Literistic, Inc.
Rami George Khouri is a Palestinian-Jordanian and U.S. citizen whose family resides in Beirut, Amman, and Nazareth. He is director of the Issam Fares Institute for Public Policy and International Affairs at the American University of Beirut. His journalistic work includes writing books and an internationally syndicated column, and he also serves as editor at large of the Beirut-based Daily Star newspaper, published throughout the Middle East with the International Herald Tribune. Peter McPherson serves as president of the National Association of State Universities and Land-Grant Colleges (NASULGC) and is President-Emeritus of Michigan State University. He is the founding co-chair of the Partnership to Cut Hunger and Poverty in Africa, and chairs the board of Abraham Lincoln Study Abroad Commission, and is Chairman of the Board of the International Food and Agricultural Development. McPherson served as President for Michigan State University for 11 years. Before his appointment as President of Michigan State University, McPherson worked at the Bank of America for five years a Group Executive Vice President. From August 1987 until March 1989, McPherson held the position of Deputy Secretary of the Treasury Department where he focused on trade, tax, and international issues. McPherson was one of three negotiators for Canadian Free Trade Agreement in final weeks and served as a member of the Farm Credit Assistance Board and the Board of the Federal Financing Bank. As an Administrator of the Agency for International Development from February 1981 until August 1987, McPherson was responsible for USAID missions in 70 countries, a staff of 5,000 and a budget of about $6 billion a year. During his tenure as Administrator, McPherson was in charge of the U.S. response to the Great Famine in Africa in 1984 - 1985 where USAID delivered more than two million tons of food to Africa over a 12-month period. During the same period, McPherson served as Chairman of the Board of the Overseas Private Investment Corporation. McPherson's previous government and private experience includes Washington managing partner of the law firm Vorys, Sater, Seymore and Pease; Special Assistant to President Ford; and Peace Corps Volunteer in Peru. Among the business boards, McPherson serves on the Board of Directors of Dow Jones and Company, the publisher of The Wall Street Journal as well as others. Lori Wallach is Director of Public Citizen's Global Trade Watch division. Public Citizen, founded in 1971, is a nonprofit citizen research, lobbying and litigation group based in Washington , D.C. Launched by Wallach in 1995, Global Trade Watch is a leader in the global citizen movement for fair trade and investment policy. Working closely with civil society, scholars, and activists in developing countries and with U.S. congressional, environmental, labor, and other allies, Wallach has played an important role in fostering the growing debate about implications of different models of globalization on jobs, livelihoods and wages; the environment; public health and safety; equality and social justice and democratically accountable governance. A Harvard-trained lawyer, Wallach has promoted the public interest regarding globalization and international commercial agreements in every forum: Congress and foreign parliaments, the courts, government agencies, and the media. Described as "Ralph Nader with a sense of humor" in a Wall Street Journal profile, "the Trade Debate's Guerrilla Warrior" in the National Journal, and "Madame Defarge of Seattle" by the Institute for International Economics, Wallach has testified on NAFTA, GATT-WTO, and other trade issues before over 20 U.S. congressional committees, numerous other countries' legislatures, the U.S. International Trade Commission and the Office of the U.S. Trade Representative. Global Trade Watch serves as a hub for an international network of citizen groups working on globalization issues. Wallach's work in "translating" arcane trade legalese - indeed, entire proposed international commercial agreements - into relevant, accessible prose has had significant national and international impact. Wallach and Global Trade Watch have been U.S. leaders in successful fights against proposed "Fast Track" legislation in 1997 and 1998 and, working with international partners, the defeat of the Multilateral Agreement on Investment (MAI), the proposed "Millennium Round" of WTO negotiations at the 1999 Seattle WTO Ministerial, the proposed WTO expansion at the 2003 Cancun WTO Ministerial and the derailing of the proposed FTAA hemispheric NAFTA expansion. Global Trade Watch's leadership in the campaign against the Central American Free Trade Agreement (CAFTA) NAFTA expansion contributed to creating a U.S. debate over that economically modest pact that required two-years, the U.S. President's continued personal intervention and a major corporate campaign to eek out a one-vote margin of passage. CAFTA specifically and trade generally proved a prominent political issue in the U.S. midterm 2006 elections with more than 100 candidates for House, Senate and Governor campaigning on "fair trade." Current projects include efforts to stop NAFTA expansions to Peru , Colombia and Panama , as well as replace the 'Fast Track' trade negotiating process with a new mechanism that restores Congress' constitutional authority in trade policy-making and empowers more diverse participation. Other projects include empowering state legislators in numerous states to enact new procedures and policies which provide them a voice in international 'trade' negotiations which affect their authority and work with a global network on the WTO and especially WTO service sector privatization and deregulation negotiations. Wallach has served as a trade commentator on CNN, ABC, CNBC, C-SPAN, and regularly appears on such programs as All Things Considered and The NewsHour with Jim Lehrer. Wallach's most recent book is Whose Trade Organization? A Comprehensive Guide to the WTO (The New Press, 2004). She has also contributed to numerous anthologies including Alternatives to Economic Globalization : A Better World Is Possible. Wallach was a founder of the Citizens Trade Campaign, a national coalition of consumer, labor, environmental, family farm, religious, and civil rights groups representing over 11 million Americans, and now serves on its board. She also is a founding board member of the International Forum on Globalization, on whose board she also serves. If you are a non-US citizen coming from abroad, please see immigration information below. Travel to the U.S. for a scientific, educational, professional or business convention, or conference on specific dates, requires a business (B-1) visitor visa. An application, Nonimmigrant Visa Application, Form DS-156, completed and signed. A Supplemental Nonimmigrant Visa Application, Form DS-157 provides additional information about your travel plans. Submission of this completed form is required for all male applicants between 16-45 years of age. It is also required for all applicants from state sponsors of terrorism age 16 and over, irrespective of gender, without exception. Five countries are now designated as state sponsors of terrorism, including North Korea, Cuba, Syria, Sudan, and Iran. You should know that a consular officer may require any nonimmigrant visa applicant to complete this form. One 2” x 2” photograph. Non-immigrant visa application processing fee - Each applicant for a visitor visa must pay a non-refundable US $100 nonimmigrant visa application processing fee. Visa issuance fee – Additionally, if the visa is issued, there will be an additional visa issuance reciprocity fee, if applicable. If there is a fee for issuance for the visa, it is equal as nearly as possible to the fee charged to United States citizens by the applicant's country of nationality. It is important that you refer to the Embassy Consular Section Web site to determine visa processing timeframes and instructions, learn about interview scheduling, and find out if there are any additional documentation items required. Questions on visa application procedures and visa ineligibilities should be made to the American consular office abroad by the applicant. If your inquiry concerns a visa case in progress overseas, you should first contact the U.S. Embassy or Consulate handling your case for status information. NOTE: Watch for a more detailed schedule coming in later January. Thank you for considering the opportunity to exhibit at the 2008 AIEA Conference in Washington DC. Several hundred senior-level leaders in international education from across the US and the world will participate in this conference. These leaders and professionals recognize the benefits of networking with organizations in the promotion of international education on their campuses. Exhibitors have the unique opportunity to share information about their organizations with these senior-level leaders and key decision makers. Only a limited number of exhibitors will be selected for the AIEA conference in order to maximize exhibitors' time with conference participants. All conference breaks will be held in the exhibit area, so as to maximize interaction time. Please note that exhibitor registration does NOT include conference registration, which must be completed separately for those wishing to participate in the AIEA conference. Note: Exhibitor fee does NOT include conference registration or materials or other conference events such as the luncheon plenaries. Exhibitors wishing to participate in the conference will need to register separately. Set Up Details: Exhibitors will set up on Monday afternoon, Feb 18, 2008. Exhibits will be open to attendees from Feb 19 through Feb 20. The opening ceremony is Feb 19 in the morning. Take down will start after lunch on Feb 20. Please leave exhibits up through 12 noon on Wednesday Feb 20. Advertising Information: Full-page ads are also available in the conference program (which will stay online for the next year). Black and white ads are available for $300. Color full-page ads are available for $500. Contact [email protected] if interested in placing an ad in the conference program. Become a sponsor at the 2008 AIEA conference and raise your visibility with senior-level leaders in the international education field! 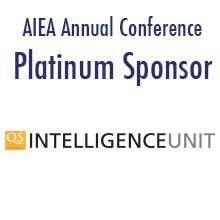 AIEA is grateful to past sponsors who have included Australian Education International (AEI), Dubain Knowledge Village, Educational Directories Unlimited, EduItalia, Institute of International Education, Institute for Shipboard Education, The Scholar Ship, Scula Lorenzo De Medici, World Education Services, Inc., and World Learning & School for International Training. CIEA 101 is as a primer for newly appointed or aspiring Chief (Senior) International Education Administrators. Experienced CIEA's will deal with internationalization of a campus, resources, and political, leadership, and managerial roles of the CIEA, as well as the transition necessary from study abroad, ESL, or international student work to this position. To achieve the goal of sending one million American students abroad annually, higher education institutions in the U.S. and internationally need to develop strategies to accommodate this student surge. As part of IIE's ongoing policy research on "Meeting America's Global Education Challenge", this workshop will explore such "capacity" issues: how do we send more and how will they receive more? The presenters at this workshop include high-level administrators from U.S. institutions, the Forum on Education Abroad, as well as key decision-makers from international organizations including Australian Education International (AEI), the German Academic Exchange Service (DAAD), and the Indian Embassy. Allan Goodman, President of IIE and William Brustein, current President of AIEA will invite workshop participants to engage with these speakers to explore both U.S. and international capacity to increase U.S. study abroad in traditional and non-traditional destinations. Presenters will offer recommended approaches and action steps for establishing institutional cultures of study abroad, to increase numbers while insuring/increasing program quality as well. From the international perspective, workshop participants will learn best practices on identifying and creating partnerships with institutions abroad with shared goals of increasing participation. Strategic planning for internationalization takes place at different levels in different institutions. Even if you have - or are developing - a university-wide strategic plan for internationalization, you still need to operationalize this at the unit level - that is, within the colleges, schools, and/or departments that make up your institution. This workshop presents a simple and effective approach to strategic planning across such units, one which will enable you to work collaboratively with them to craft an approach which fits with each unit's academic culture, which reflects their goals, strengths and limitations, and which is sustainable over time. Our presenters are all from Purdue University, an institution which is developing a strategic plan for internationalization, as well as operational plans for its constituent colleges. Participants will learn what strategic planning is and how it differs from other forms of planning. They will also: Learn why a strategic plan is helpful to the internationalization process. Learn the main steps in strategic planning. Learn how to present strategic planning to faculty and administrators to ensure buy-in, and to work effectively with a diverse group of stakeholders. Learn how to evaluate the results of a strategic plan. In the years since 9/11 the Middle East and North Africa (MENA) region has seen very dynamic changes in the field of international education. International student flows from the region declined sharply and are rebounding. Local groups, many with strong local government support, and US institutions have established branch campuses and entire institutions following the American model of higher education. American students have flocked to Arabic language courses and courses on the region and growing study abroad enrollments in the region are taxing existing programs. At the same time that some have put Middle East studies programs under a microscope at home, US government programs are bringing increasing numbers of young people and undergraduate students from the region to US campuses. In this workshop a series of speakers will address many of these topics to help senior international education administrators understand opportunities and pitfalls in this important and dynamic region of the world. Few U.S. higher education institutions have articulated international learning outcomes or established methods for assessing student achievement of those outcomes . This workshop is designed to increase participants knowledge of international learning assessment, develop skills in implementing assessment, and enhance ability in using results. Presenters will share their experiences in assessment with the group, facilitate discussion on implementing international learning outcomes assessment, and answer questions on the successes and challenges they faced as they worked through the processes of developing a successful assessment approach. Conference Hotel - JW Marriott Pennsylvania Avenue in downtown Washington DC. HOTEL INFO: The 2008 AIEA Conference will be held on Feb 17-20, 2008 at the luxurious JW Marriott Pennsylvania Avenue in downtown Washington DC. AIEA has secured a special conference room rate of $189. To make reservations, please call directly to 1-800-228-9290 or 1-202-393-2000. To ensure that you will have a room at this special rate, please reserve your room as soon as possible.